I'm definitely still learning when it comes to fondant. 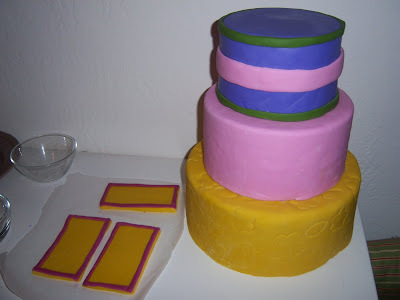 I've read a lot of books and watched a lot of videos about how to cover cakes and it looks so simple, but it's tricky to keep the fondant thick but not too thick, pliable but not too soft and sturdy but not to dry. 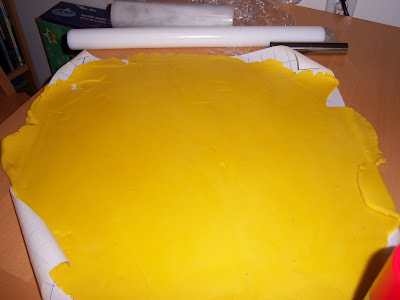 I used both oil spray and cornstarch to keep the fondant from sticking while I rolled depending on if it felt too soft or too dry. Both work well. 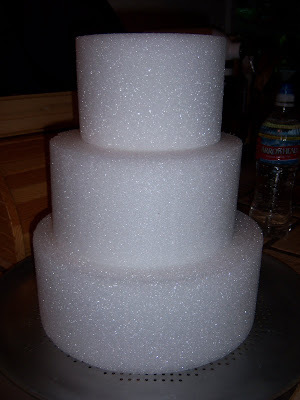 I love the color scheme and the foam is so light and easy to work with. I used flower and leaf-shaped cookie cutters to press a pattern into the bottom layer, and cut out three rectangles that will be decorated to look like the Local Flora sign for a cake topper. It def took a lot of trial and error, and I'm still not 100% sure how to avoid "folds" in the fondant when you are shaping it to the cake, but overall I was pretty pleased with how this step turned out.